I had about a day to make my preparations. I finished up Chapter 9 of the book about Google I am working on, and swung into gear. It had been a while since I had been backpacking, so I needed to remember what stuff to bring, to shop for food, load a backpack and make sure I could carry it, and get a wilderness permit. The wilderness permit part of it was easy. 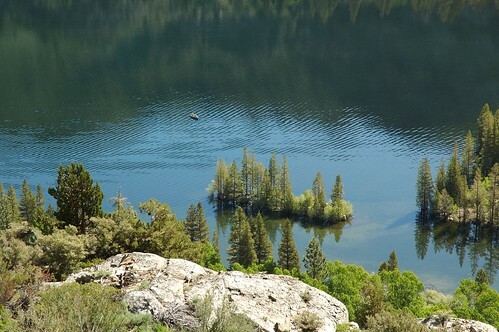 I called the reservation number at Inyo National Forest, and for $5.00 on my Visa card got a wilderness permit which would be left for me in the night drop box at the Mono Lake Visitors Center in Lee Vining. Lee Vining is on the eastern side of Tioga Pass. 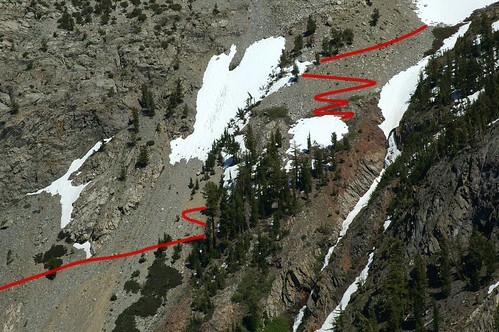 The pass had opened a few days before following one of the heaviest snow years in recorded history in the Sierras. As I chatted with the reservations ranger, he told me that there was lots of snow (I knew that already), and that I probably wouldn’t see too many people or mosquitos on my trip. I said both of these were good things. He also told me I needed to carry my food in an approved bear-resistant container. These bear canisters are made of molded plastic and use screws that you turn with a coin (or back of a spoon) to make it difficult for a bear to get inside. Personally, I kind of think that if a bear can get into a car trunk, a bear can probably get into one of these things. But regulations are regulations, so I added a bear food storage thing to my list of supplies to buy at REI (Recreational Equipment). I also wanted to figure out a way to store my digital images in the field without having to use a whole mess of memory cards, so I bought a 40 Gigabyte battery operated photo storage gadget. I’ll be writing more about digital photo field storage options in a subsequent blog entry. Wednesday morning early I left the three boys and Phyllis, drove out through the Bay area sprawl, across the central valley via Oakdale and Manteca, and onto the North Yosemite highway at China Camp. 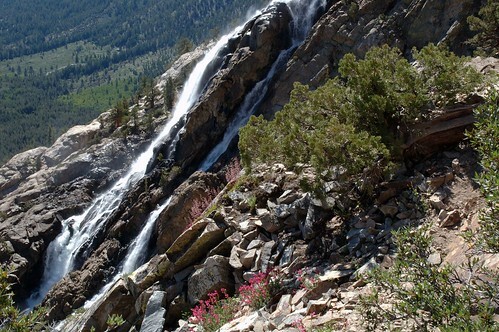 From there, after passing the park entrance station at Crane Flat, I turned onto the spectacular road that goes up to Tulomne Meadows and Tioga Pass. On the other side of the mountains, in Lee Vining I picked up my wilderness permit – once I signed it my permission to hike was official! – had some dinner in a restaurant, and headed for a campground near my trailhead. The trailhead I was going to use, Rush Creek, starts from Silver Lake at an altitude of about 7,200 feet on the June Lake loop. Grant, Silver, and June Lakes are a kind of messy resort (with a ski lift and many trailer parks) the first stop south of Lee Vining and the Tioga pass road. So I drove south for about ten miles, and then turned right towards the mountains. As I passed Grant Lake, the high rolling sage brush turned to mountain forest, rock and snowy vista. The next morning I grabbed a massive breakfast at the Silver Lake Resort. For the record, I ate “Miner’s hash – everything but the kitchen sink.” I can’t vouch for the kitchen sink, but it certainly had eggs, ham, bacon, and potatoes. They are big on gold and silver mining and hearty eating in the tourist enclaves of the eastern Sierra. It’s amazing how easy it is to leave our everyday world and enter a completely different universe. This other universe is one where issues are simple: survival, not falling down a cliff or into a hole in the snow, being warm and dry, having enough to eat, and (if you are fifty-ish with kids) not having a stroke or heart attack alone in the wild. The wilderness is grand and majestic and magnificent – but it is utterly alien to us, and does not care in the least about us and our concerns, our well-being, or whether we live or die. Depending upon how you look at things, this is either comforting or terrifying (or both). 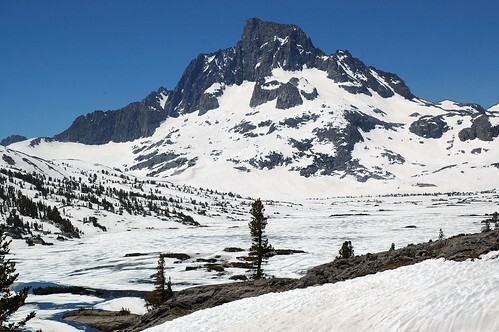 Hikers do vanish each year in the Sierran wilderness; for example, probably no one will ever know what happened to Fred Claasen or Michael Ficery other than that they died. Perhaps it is a good time to start making clear the mistakes I made on my journey through one of these cracks into the alternate universe that is the wilderness. First, I wasn’t really paying attention when people (such as the reservation ranger) told me about all the snow, and how empty the Sierra wilderness was this year. I also wasn’t taking the time to get adjusted to the change in altitude. I drove from sea level to above 7,000 feet in one day, and then started hiking up. No wonder I didn’t feel so good. My head was pounding, and my breathing labored. Stay tuned for one big whopper of a mistake to come (though obviously I am here to write about it). Right about at the second crossing of the tracks I met a hiker, my first on this trip. He was an old codger dodger – well, no older than me, but you know what I mean – carrying a day pack and his name was Billy. Billy’s hobbies were leading boy scouts from his home near Ventura into this area and helping with search and rescue operations. He knew this part of the mountains pretty well. I told him what I was planning: to head up the cliff on the little-used trail on the south side of Agnew Lake, continue past Spooky Meadow, Clark Lake, and Summit Lake, and find the Pacific Crest and John Muir trails near Thousand Island Lakes, camp there a few days, and then head out the same way. Billy suggested gently that I might want to reconsider. He said that in thie year of extraordinary snow the trail I was planning to take would almost certainly be under snow and probably impassable and dangerous. I should at least scout it, he said, from the other side of the lake before heading up it. Billy also suggested several longer (but less steep and dangerous) ways to get into the high country. I can say with absolute certainty that I paid no attention to anything Billy the search and rescue codger-dodger said to me. When I got to the junction with the side trail I’d been planning to take – my trail led off to the left on the far side of the lake – I took it without looking ahead. I did notice that there was no sign marking my trail. I later learned that they didn’t post “my” trail because they wanted to discourage people from using it. I took the photo from the other side of the lake on my way out a few days later because I wanted to get a good look at where I had started my walk on the wild side. The first part up along the side of a steep scree field was no particular problem, although I did have to pause to take a breath frequently. When I got to the trees shown in the photo I had to start pulling myself up hand over hand, backpack and all. As I continued up the snow crossings started to get more and more difficult and scary. Some were undercut with fast running water, and I knew a collapse was possible at almost any time in these conditions of brutally hot sun and massive snow. As I’ve said, I drew the trail into the photo above. The part I drew in towards the top was the last I saw of the trail for many miles – it vanished under a snow field, and didn’t reappear. I began to wonder why I hadn’t brought proper gear for traversing snow – an ice ax, or at least crampons. Gators would have been nice, too, although more a matter of comfort than safety. At some point when I was fairly shortly above the area shown in the photo I realized that I had lost the trail in a terrain of infinite snow and steep cliffs, and that it was probably too dangerous to go back down the way I had come. This story is continued in Does the Wilderness Care about Me? 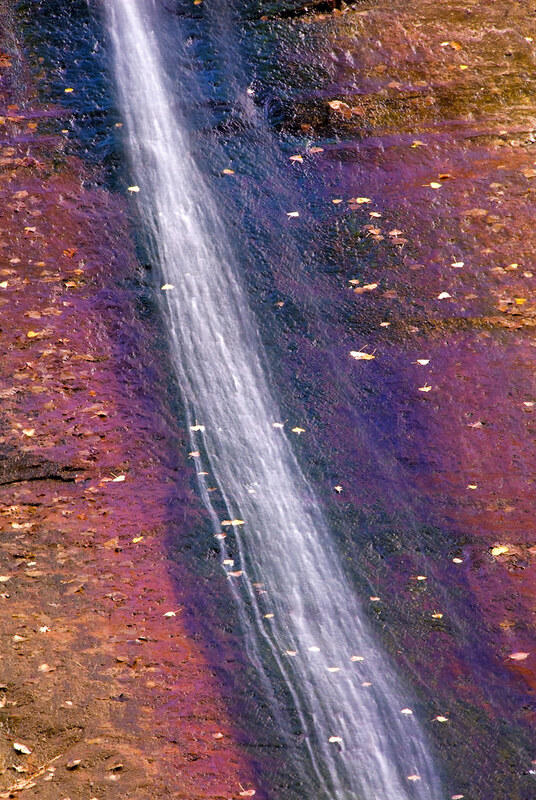 Alamere Falls, photo by Harold Davis. View this image larger. Alamere Falls tumbles down a cliff to the Pacific Ocean in Point Reyes National Seashore. This awesome waterfall lies north of the Bolinas plateau and south of Arch Rock. From the Bolinas side, it’s about four miles on good trails, then a half a mile scramble down to the falls and beach, so a total round-trip hike of about nine miles. The Point Reyes southern district trail map shows the route pretty well (look towards the bottom of the map). Julian, my oldest son, and I started in mid-afternoon with a good lunch at Robata. For the record, Julian inhaled 18 gyoza (Japanese potstickers). Then we stopped in Mill Valley and picked up a slab of bread and some gourmet chocolate to take along for dinner, and headed for the trailhead. Our plan was to get to the falls an hour or so before sunset when the photography would be good, and hike most of the way back in the dark. It was a pleasure hiking with Julian, who enjoyed the sights and sounds of birds, flowers, and bullfrogs. The only real disappointment was when the trail passed Bass Lake, a possible swimming spot. But poison oak made the approach to the lake too tricky to attempt. When we got to the turn-off from the Coastal Trail down to Alamere Falls, Julian particularly took pleasure in the Park Service’s “Dangerous and Unmaintained” trail sign. This path does tunnel through poison oak in places. You reach the top of the falls by jumping across the creek as it approaches the falls, and are then standing 150 feet or so above a sheer cliff to the beach. It’s very dramatic and a bit vertigo inducing (photo from the top of Alamere Falls to follow). From the top of the falls, we made our way down a crack in the cliff to the beach. This is a reasonably steep climb, and I decided I didn’t want to go back up it in the dark. On the beach, the sun was heading down and a rainbow played in Alamere Falls (above). I let Julian take off his clothes for a dip in the creek (below) while I photographed. On the trail home, as it got dark, we switched on our head lamps and talked about a wide range of topics. Julian said, “When I’m grown up, I’ll take my oldest son here.” Back in the parking lot, Julian was asleep almost as soon as I cranked the engine. There was no traffic, and we were home to a sleeping house by midnight. 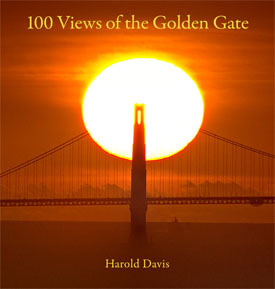 The Wave #1, photo by Harold Davis. View this image larger. This is a photograph taken at the Wave, a beautiful geologic wonder of the world. Chambers, striations, passages: it’s hard to describe the wonders of this place. So I’ll be posting photos to show, not tell. 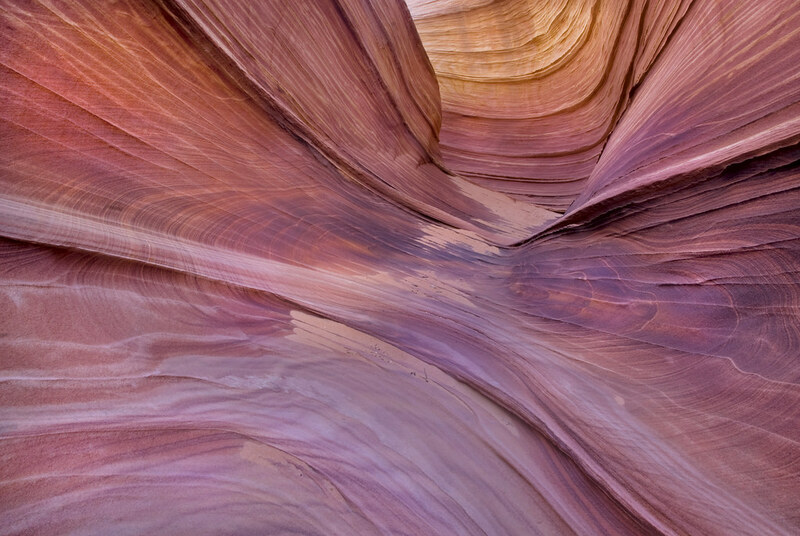 The Wave is in a special administration area, which is rather well run by the Kanab district office of the BLM (Bureau of Land Management, part of the U.S. Department of the Interior). 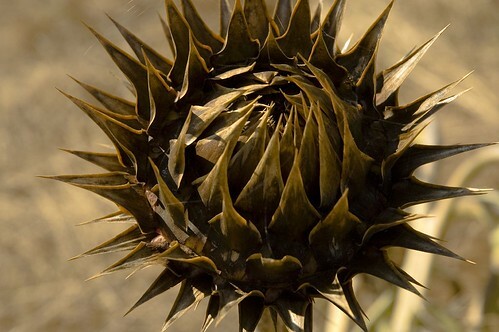 BLM regulations cap the number of people per day at 20, 10 selected by advance lottery, and ten first come first served. BLM regulations also specify that everything packed in must be packed out, including human waste. When you get your permit, the BLM gives you a kit with a series of maps and photos. There’s no trail as such, and a lot of the hike is across slick rock. But the BLM treasure-hunt kit is great, it shows you photos correlated with a strip topographic map of what you should be seeing each step along the way. People, particularly photographers, flock to the Wave from around the world. May and October are the most popular months (the summer is just too danged hot and dangerous), but April and November are also good times to visit. When I got to the Wave, the central area was occupied by three German photographers who were very loud, smoking heavily, and whose gear was all over the place. This was offensive to me. A place like the Wave is the closest thing I have to a church. How would these visitors from Germany have felt about someone behaving in a similar fashion in the middle of a Gothic church in the ancient downtown of a medieval German city? The photo above shows a side corridor or chamber (you can walk through it) lit by the setting sun. I used a polarizer filter to maximize the color saturation, and an exposure of two seconds at f/22 to get the most depth of field I could. In Perspectives, I wrote “I have found my center, and know what I am. I can hike the canyon rims, photograph sunset, and come down by starlight.” It’s dangerous to take wilderness casually, and to be over confident. You know what pride cometh before as well as I do. I stayed at the Wave long after everyone else had left to photograph by the light of sunset, and then to make a thirty minute exposure by starlight of the Wave. Sunset comes early this time of year, and the jumbled country around the Wave would be very dark at night. Still, I figured I’d have no problem reversing the order of the BLM checkpoints using my headlamp. In the event, I had the light of the crescent moon for the first twenty minutes or so of my hike. Then the moon set, and I lost my way. The route was marked by cairns, which are rock piles, marking the way across the slick rock. I saw one cairn, but not the next. Foolish me, I figured I knew the direction I was headed. From then on, it was like a bad dream. I was up and over mounds and around dry basins. 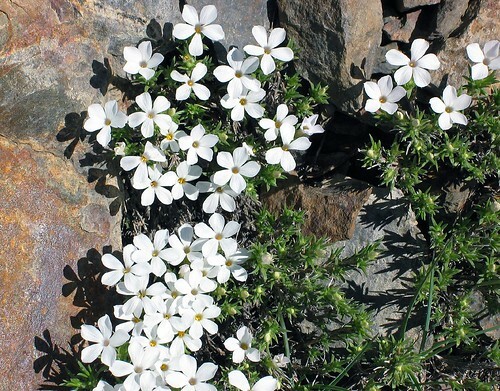 The land seemed to be driving me to steeper and steeper ground, and it was hard to tell in the light of my beam whether a drop-off was three feet, thirty feet, or three hundred feet. In the best of times, this is confusing maze-like terrain, let alone on a dark night. Pretty soon, I’d forgotten how to get back to my starting point. The shapes of mountains and canyons loomed larger and larger, and I didn’t seem to remember anything like this from the fairly brief hike in. 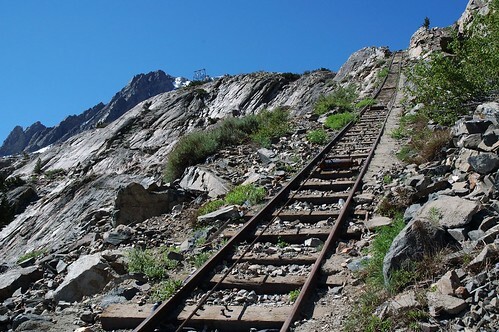 I’d see a stone ramp, go up, meet an obstacle to go around, find another way, and even my recent history was lost. I realized that this couldn’t go on. It was very hard to see where I was going. I was getting very tired after a long day on little food, with lots of exertion photographing. My water was low. To continue in the circumstances was to risk breaking my neck. So the next time I found myself on a platform facing what looked like a precipice opening at my feet, I stopped. I had a down jacket, and knew I wouldn’t die of hypothermia in one night. As the pale light of dawn began to illuminate things, I was glad I had stopped. Between impassable crags, a gorge and network of crevasses opened at my feet. I turned around, and began to make my way back down, coming shortly to the cairn-marked route, which I had crossed without recognizing it in the night. A couple of hundred feet closer to the trailhead, I met one of the BLM people coming in. He said he was running late. I said I was running even later, and told him my story, admitting to feel a bit embarrassed. He told me I wasn’t the first, it happens lots of times (if that’s a consolation). We talked about contacting my wife so she wouldn’t call out search and rescue. He said heck, when he’s in the office, he ignores calls for search and rescue for two or three days because “they usually show up”, and, heck, where are you going to start looking for someone in this crazy, convoluted terrain, anyway? When all is said and done, I’m thrilled with my time at the Wave (thought not my cold and sleepless night). 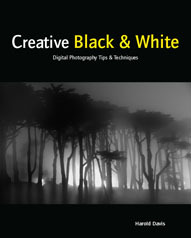 I’ve many interesting photos to look through and post-process. But in the future I’ll try to be less prideful about my relationship with the wilderness. Falling into the Virgin, photo by Harold Davis. View this image larger. I wandered and slogged up the Virgin River towards the narrows. Boots and jeans soaked, walking up the river like some amphibious creature, camera and tripod high on my back. About a mile beyond the end of the trail, I came upon this waterfall tumbling down the slick rock into the Virgin. I exposed for two seconds to soften the water, and used a polarizing filter to bring out the red colors in the rock. Peeking Bridge, photo by Harold Davis. View this image larger. OK, so this is the Golden Gate Bridge peeking, not a Peking Duck. A cheap shot, I know, but I have a weakness for puns. Also, I’ve been losing weight lately, which tends to make me think of everything in the context of food. 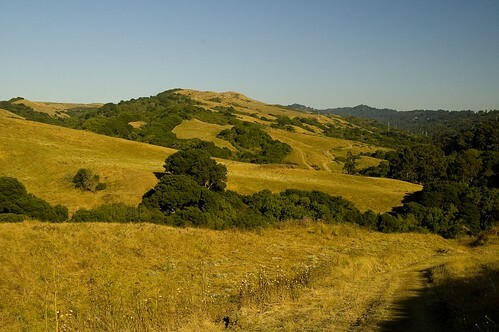 This view is from Coyote Ridge, looking across Tennessee Valley, with the Old Springs Trail passing through a gap in Wolf Ridge and continuing as the Miwok Trail. 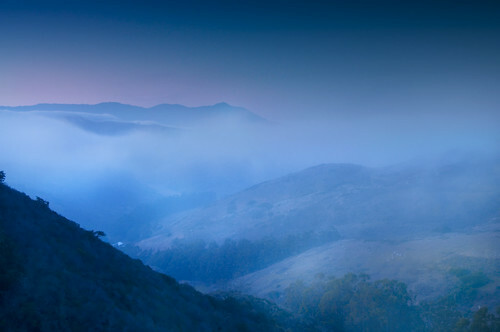 The Marin Headlands is amazing as a wilderness so close to San Francisco. As I’ve commented before, I feel more alone (and more at risk) in a wilderness where you can view civilization than a wilderness where, well, there is only wilderness surrounding. Related story: Pirate’s Cove and Marin Headlands. 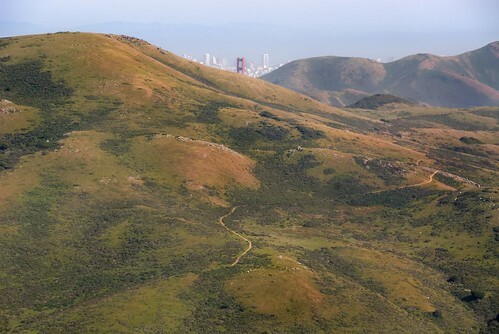 Related link: Park service trail map of the Marin Headlands. Nicky on the Inspiration Point Trail, photo by Harold Davis. 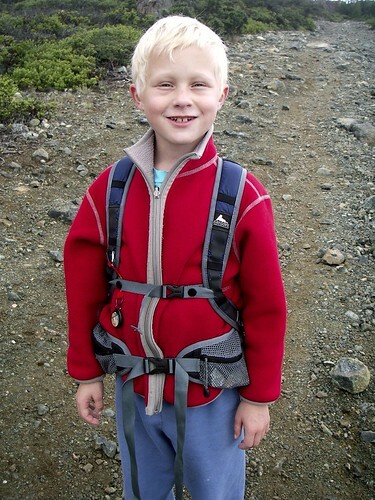 It’s great that my kids love hiking. 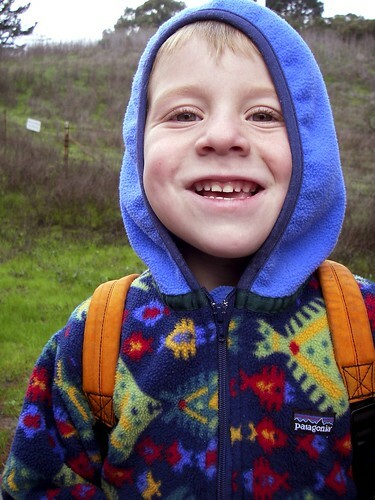 Nicky, shown above, is at the start of the Inspiration Point trail in Tilden Park near where we live. Julian, below, is shown on the Pine Mountain trail. Of course, it’s also nice to come home to a warm fire. I photographed our family together on a low kids-height sofa using my self-timer and a low kids-height tripod. I used the ambient light from the room and fireplace, and a fairly long exposure (1/6 of a second). From left to right: Nicky (age 5), Phyllis, Mathew (he’s two), Harold, Julian (9). Perhaps it is but a reflection of reality that the kids look relaxed in front of the fire, and Phyllis and I look crazed and tired. Generations, photo by Harold Davis. Three generations went hiking together over Labor Day weekend. 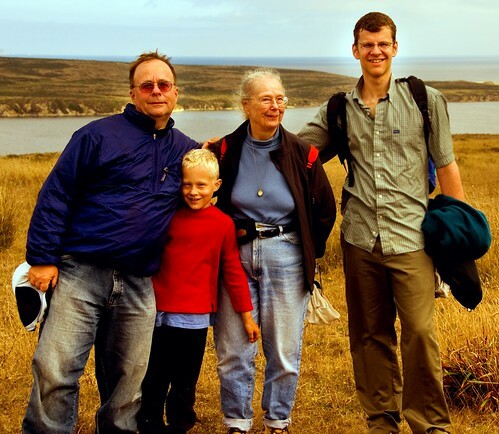 Shown on the Estoro Trail on Point Reyes from left to right: Harold (me! 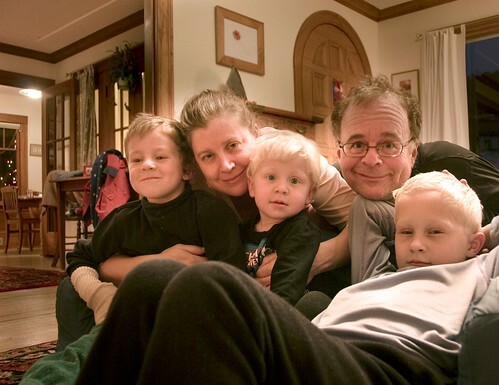 ), Julian (my son), Virginia (my mom), and Peter (my nephew). Campfire in the Wilderness, photo by Harold Davis. View this photograph larger. 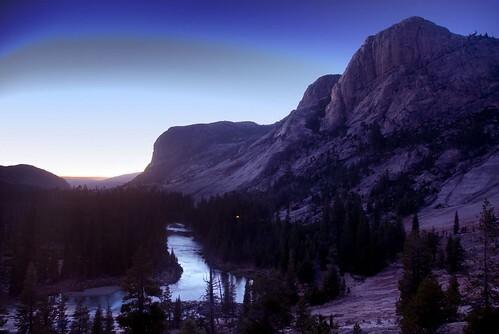 If you climb the ridge to the west of the High Sierra camp at Glen Aulin, there’s a great view down the Tuolomne River. On the topo maps, this area is called the Grand Canyon of the Tulomne. At sunset, we saw a wilderness campfire in the trees between Wildcat Point and the Tulomne River. How wonderful and solemn to camp in such a grand place! By the way, this photo is looking west towards Hetchy-Hetchy and the central California valley. You can see the haze of pollution in the distance at the horizon. 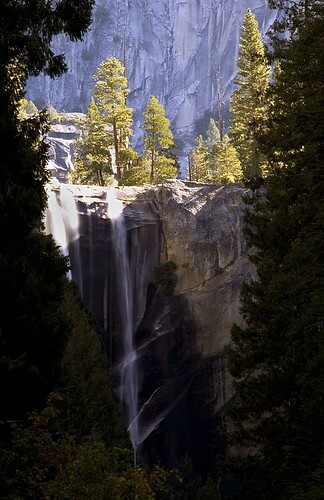 Vernal Falls Morning Light, photo by Harold Davis. I spent the first couple of nights of my road trip in Yosemite Valley. DNC and the Park Service must have a cozy relationship made up one part cronyism, one part shared ideology, and one part kick-backs. My own experience of nature was marred by a loud exhaust fan that ran all night. Although this subject is worth some serious investigative reporting, enough ranting! I had a great time anyhow. At this time of year (mid-October) the Valley floor only gets sunshine in the middle of the day, say about 10 in the morning to 3:30 in the afternoon. I woke to a beautiful day! My plan was to photograph late afternoon and sunset from Sentinal Dome and Glacier Point, but I thought I’d start out by stretching my legs and walking up to the first bridge on the Vernal-Nevada Falls trail. Oh, I should mention that the big Valley waterfalls were mostly dry. Yosemite Falls was not flowing. One ranger told me that tourists regularly requested that he “turn the waterfalls” back on. Anyhow, I walked took the shuttle bus to the trailhead and walked the mile to the first bridge. I was alone in the early morning shade. I looked up. 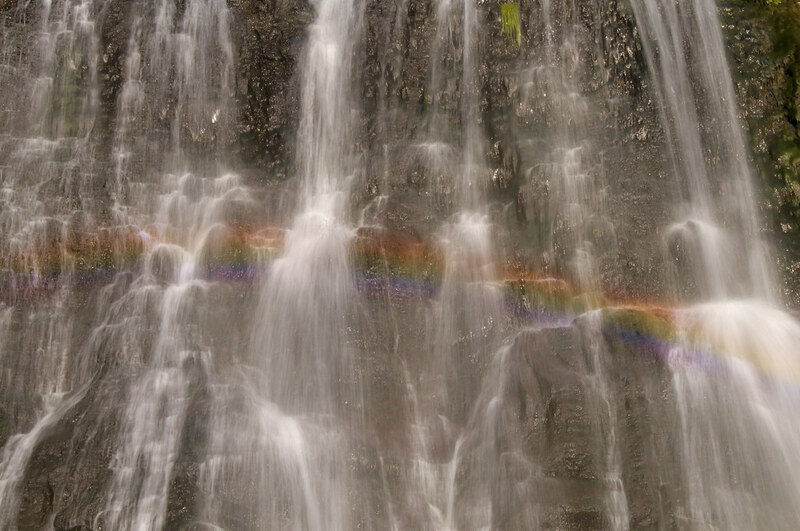 Sunlight was hitting the top of the falls. It was time to take out my camera and tripod! This page sponsored by Garden-Fountains.com. 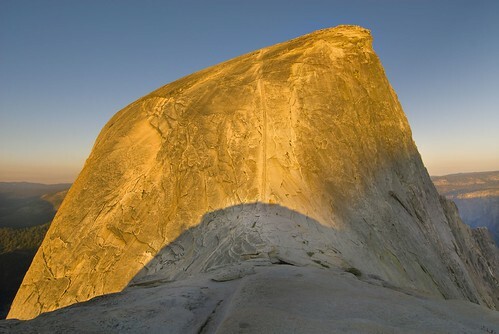 Half Dome View at Sunset, photo by Harold Davis. Julian, my eight year old, and I went on a camping trip for most of this last week. 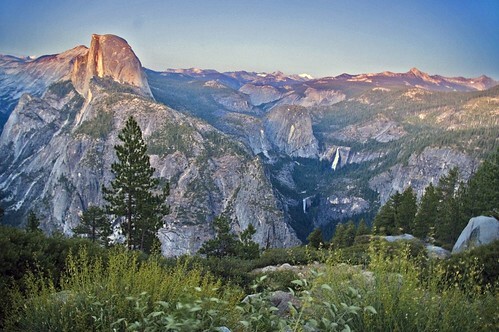 We started in Yosemite Valley, staying in a tent at Camp Curry for several nights. This year there are many visitors from Europe and Asia in the national parks. It’s amazing how chic these people look, even in an environment as inhospitable to chic as Camp Curry – particularly the French and Italian women. Camp Curry is run by the park concessionaire that runs all the businesses in Yosemite Park, Delaware North Corporation. This company has nothing to do with either the State of Delaware or the direction North. It is named after a street intersection in Buffalo, New York, and manages to both be incredibly smarmy (running advertorials lauding its environmental practices in front of “campfire” presentations), to serve food that is memorably awful, have zilch in the way of customer service, and be unable to keep its restrooms from becoming filthy – hence my surprise at the aptitude European women have at staying chic. But Julian loves the place. He gets to run around, explore, and climb all the rocks that are between the tents. He likes sleeping in the canvas tents (actually, a rather filthy cross between a tent and a cabin). Oh, to be eight again and have a brave new world to explore! We checked in pretty late Sunday night, and spent Monday hiking (up the Yosemite Falls trail), in the swimming pool, and swimming in the Merced River (the Valley temperatures were in the 90s). In the late afternoon, we got in the car and toodled up to Glacier Point (it is about an hour drive). First, we stopped along the way, and fixed a Mountain House dinner on my camp stove. Thus fortified, we found a spot a few feet from the three thousand foot drop-off to the valley. Julian was cool as a cucumber, but it made me a little nervous to see him sitting so calmly close to the brink. I set my camera on the tripod, and read “Half Magic” by Edgar Eager to Julian as we waited for the sunset. The thing that really surprised me about the photo above and the one below is that I took them after dark. These photos are probably only really possible with digital technology. By the time I took both pictures, everything was pretty completely dark. 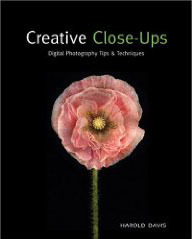 I had the Nikon D70 set on Aperture preferred metering with the lens stopped way down – f/25. Exposures were long, two seconds in one case, four in the other. Now here’s where it gets weird. Basically, when you open the camera RAW files of these photos in Photoshop, the default settings in the CS2 conversion dialog makes them look like washed-out daylight shots. I had to fiddle with the conversion settings quite a bit to get them to look like sunset, let alone the almost-darkest-night which was the way it really looked. We didn’t leave Glacier Point until about 10PM. Julian fell asleep during thr ride back down to the Valley. When we got back to Camp Curry, I got him up and he walked to our tent. 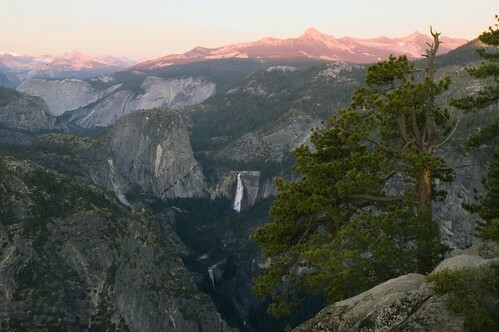 In the morning, he didn’t remember waking up – just watching the sunset at Glacier Point.